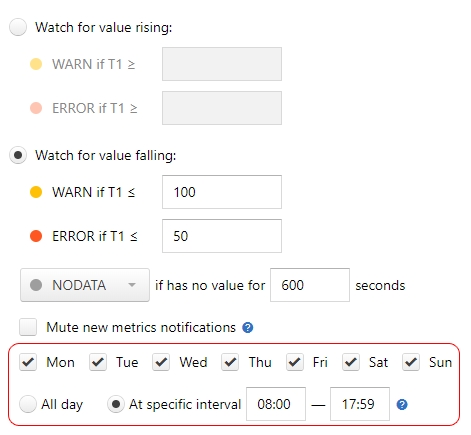 Moira provides two ways of defining allowed time intervals for notifications. Notifications generated by this subscription will arrive only on weekdays, from 08:00 to 17:59 local time. If an event happens on weekend, you will receive a notification at 08:00 on Monday. So notifications are not skipped, you just receive them later. Events will still appear on the event history page at the time when they happened (see Current State and Event History). Let’s say, you have a popular website, that serves over 1000 page views per second during a day. You can set up a trigger to notify you when you have less than 50 page views per second - obviously, something is wrong. You also need to disable this trigger for the night, because at night all of your users sleep, and this metric is irrelevant. 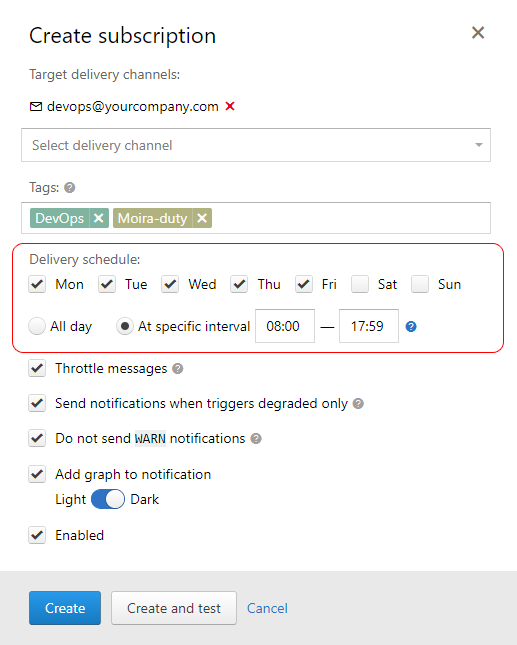 No events will be recorded for this trigger outside of watch time - you will receive no notifications, and the event history page will be empty (see Current State and Event History).